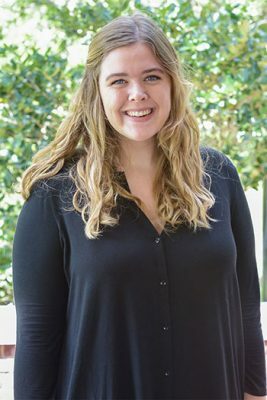 Sarah Hollmann was never afraid to dive in head first at Stetson, such as taking an upper-level political science course during her second semester as a first-year student. Given her impressive credentials upon arriving to campus, Hollmann’s academic adviser thought it would be a “great idea” for her to take the challenge. “And I died. It was really difficult,” Hollmann described. Hollmann made it through, however, displaying what would become characteristic diligence and benefitting from what turned out to be patented support. In May, Hollmann received a bachelor’s degree in political science, with minors in Africana studies, gender studies and anthropology. Her next stop is the University of Florida, on full scholarship and with a fellowship award, in quest of a doctorate in political science. 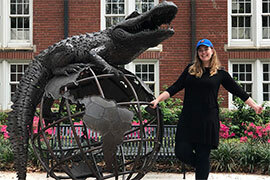 Hollmann will now pursue a doctorate in political science at the University of Florida. For those accomplishments, Hollmann, from DeLand, gives a huge assist to her Stetson community. While she didn’t have to travel long to get to Stetson, the support received has taken her far. “There’s no way I would be able to pursue this Ph.D. program that I’m doing next, if [it weren’t for] all the people that helped me out along the way,” she commented. In turn, Hollmann received her own form of community help. “A really amazing [McCullough] family and an amazing experience, because I was able to get a lot of support from my fellow students. … It was, once again, one of those Stetson things that never would’ve happened if I hadn’t been in this exact place at this exact time,” Hollmann recounted. Finally, through integrity and excellence, Hollmann found her niche, but not before taking more chances. As part of her research, Hollmann (here in Belfast) interviewed 24 people about politics in Northern Ireland. Last summer, Hollmann earned a SURE Grant from Stetson to pursue independent undergraduate research of interest (Stetson Undergraduate Research Experience). 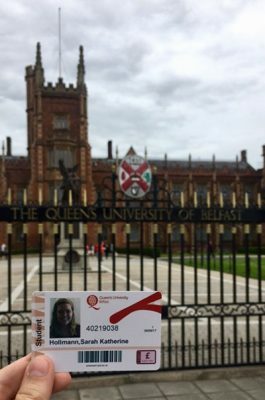 She spent a fully funded semester in Northern Ireland, where she conducted 24 interviews with ex-combatants, political figures and religious leaders. Hollmann deflected credit for her project’s success. “Honestly, everybody, every professor in the [political science] department had a hand in it,” she said. Yet, there was no conflict about the work’s merits, as Hollmann earned an invitation to participate in a May European Union Conference in California. Also, in June she traveled to Belgium and visited the European Parliament (an important forum for political debate and decision-making at the European Union level). There was plenty of personal growth, too. According to Hollmann, she needed to learn one other lesson at Stetson: life balance. Hollmann did, of course. “I think my biggest thing was I came onto campus and I tried to do everything all at once, and I realized that wasn’t sustainable,” Hollmann said. “So, different mentors and different friends and different professors were kind of like, ‘Sarah, why are you doing this to yourself? You shouldn’t be president of five different organizations; why don’t you try three?’ So, that really helped and that was probably my biggest barrier, realization that even though I wanted to do it all, I couldn’t.